The majority of smart home features might not actually affect the overall value of a home, experts say. The question becomes then, why are builders turning to smart home as the next biggest selling point? You wouldn't buy a home that didn't have running water, electricity, and in some cases, internet access. Like these standardized features, smart home is gradually becoming the norm in new home construction. In fact, there are many builders who are adding smart home and security technology as part of their base home offering. Why? Smart home may not immediately add to the overall value of the home monetarily, but one thing it does very well is spark an interest in the homebuyer and helps drive home sales. The reality is most home buyers are looking for the major details: number of rooms, home size, location, and other essential amenities. Smart home is not necessarily at the top of the list. However, when a home buyer is stuck on selecting their ideal home, features like home automation and security could be the deciding factor in their selection. In fact, according to BDX Research, 75% of new homebuyers believe that a brand-new home with smart technology could be the tie breaker. The Point: A home packed with smart devices may not boost the actual value of the home, but it could help sell the home faster by making it stand out. Ease of Use: Homeowners are spending more on smart home technology than ever before, investing in systems that offer them convenience and security. Many of the smart home platforms available today have unique limitations and requirements that can be frustrating, require lots of research and some general knowledge on how these systems work. A home packed with smart home devices that require separate apps for the door lock, cameras, lights, security, etc. can turn away buyers who aren't necessarily tech-savvy. Reliable & Future-proof: Builders can offer a platform that is easy to use, can be expanded upon at any time, works with brands their customers already know, and can be controlled using a single app. Additionally, when selecting a proper smart home platform, homeowners are not left in the dark if an issue arises. It's important to select a platform that offers tech support to the homeowner after they move in. Not only is this a massive marketing value to the builder, the homeowner is more at ease knowing their system is supported for the long haul with tech support and future updates. Flexible: Smart home platforms are unique in the sense that they often support many devices that work out of the box. One of the most sought-after features of a smart home platform is the ability to scale the system from volume-based installations, to fully custom luxury-level projects that feature shades, entertainment, and more. 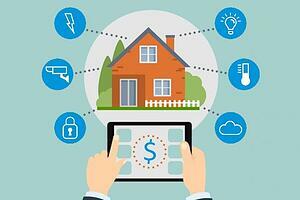 Thinking about bringing smart home into your line of homes? Let your first step be with Clare. We'll help you successfully implement smart home into your business model. If you wish to learn more about the Clare Builder program, download our Playbook below, or contact us to get started.